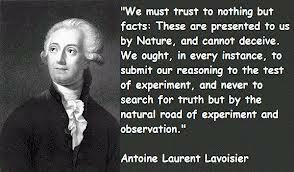 Antoine-Laurent de Lavoisier (August 26, 1743 - May 8, 1794) was a French nobleman prominent in the histories of chemistry, finance, biology, and economics. He stated the first version of the law of conservation of matter, recognized and named oxygen (1778), disproved phlogiston theory, and helped to reform chemical nomenclature. Lavoisier is often referred to as the father of modern chemistry. He was also an investor and administrator of the Ferme Générale, a private tax collection company; chairman of the board of the Discount Bank (later the Banque de France); and a powerful member of a number of other aristocratic administrative councils. Born to a wealthy family in Paris, Antoine Laurent Lavoisier inherited a large fortune when his mother died. He attended the College Mazarin from 1754 to 1761, studying chemistry, botany, astronomy, and mathematics. His first chemical publication appeared in 1764. In 1767 he worked on a geological survey of Alsace-Lorraine. He was elected a member of the French Academy of Sciences in 1768. In 1771, he married 13-year-old Marie-Anne Pierette Paulze, who translated from English for him and illustrated his books. Beginning in 1775, he served on the Royal Gunpowder Administration, where his work led to improvements in the production of gunpowder and the use of agricultural chemistry by designing a new method for preparing saltpeter. Some of Lavoisier's most important experiments examined the nature of combustion, or burning. Through these experiments, he demonstrated that burning is a process that involves the combination of a substance with oxygen. He also demonstrated the role of oxygen in animal and plant respiration, as well as its role in metal rusting. Lavoisier's explanation of combustion replaced the phlogiston theory, which postulates that materials release a substance called phlogiston when they burn. He also discovered that the inflammable air of Henry Cavendish which he termed hydrogen (Greek for water-former), combined with oxygen to produce a dew, as Joseph Priestley had reported, which appeared to be water. Lavoisier's work was partly based on the work of Priestley (he corresponded wtih Priestly and fellow members of the Lunar Society). However, he tried to take credit for Priestley's discoveries. This tendency to use the results of others without acknowledgment then draw conclusions is said to be characteristic of Lavoisier. In Sur la combustion en general (On Combustion, 1777 and Considérations Générales sur la Nature des Acides, 1778), he demonstrated that the "air" responsible for combustion was also the source of acidity. In 1779, he named this part of the air oxygen (Greek for acid-former), and the other azote (Greek for no life). In Reflexions sur le Phlogistique, 1783, Lavoisier showed the phlogiston theory to be inconsistent. Lavoisier's experiments were among the first truly quantitative chemical experiments ever performed. He showed that, although matter changes its state in a chemical reaction, the quantity of matter is the same at the end as at the beginning of every chemical reaction. He burnt phosphorus and sulfur in air, and proved that the products weighed more than he original. Nevertheless, the weight gained was lost from the air. These experiments provided evidence for the law of the conservation of matter. Lavoisier also investigated the composition of water, and he named the components of water oxygen and hydrogen. With the French chemist Claude-Louis Berthollet and others, Lavoisier devised a chemical nomenclature, or a system of names, which serves as the basis of the modern system. He described it in Méthode de nomenclature chimique (Method of Chemical Nomenclature, 1787). This system is still largely in use today, including names such as sulfuric acid, sulfates, and sulfites. His Traité Élémentaire de Chimie (Elementary Treatise of Chemistry, 1789, translated into English by Robert Kerr) is considered to be the first modern chemical textbook, and presented a unified view of new theories of chemistry, contained a clear statement of the Law of Conservation of Mass, and denied the existence of phlogiston. Also, Lavoisier clarified the concept of an element as a simple substance that could not be broken down by any known method of chemical analysis, and he devised a theory of the formation of chemical compounds from elements. In addition, it contained a list of elements, or substances that could not be broken down further, which included oxygen, nitrogen, hydrogen, phosphorus, mercury, zinc, and sulfur. His list, however, also included light, and caloric, which he believed to be material substances. Lavoisier's fundamental contributions to chemistry were a result of a conscious effort to fit all experiments into the framework of a single theory. He established the consistent use of chemical balance, used oxygen to overthrow the phlogiston theory, and developed a new system of chemical nomenclature which held that oxygen was an essential constituent of all acids (which later turned out to be erroneous). For the first time the modern notion of elements is laid out systematically; the three or four elements of classical chemistry gave way to the modern system, and Lavoisier worked out reactions in chemical equations that respect the conservation of mass (see, for example, the nitrogen cycle). Of key significance in Lavoisier's life was his study of law. This led to an interest in French politics, and as a result, he obtained a position as tax collector in the Ferme Générale, a private tax-collection company, at the age of 26, where he attempted to introduce reforms in the French monetary and taxation system. While in government work, he helped develop the metric system to secure uniformity of weights and measures throughout France. As one of 28 French tax collectors, a powerful figure in the unpopular Ferme Générale, Lavoisier was branded a traitor during the Reign of Terror by revolutionists in 1794, and guillotined in Paris, at the age of 51. Ironically, Lavoisier was one of the few liberals in his position. His importance for science was expressed by the mathematician Joseph Louis Lagrange who lamented the beheading by saying: "It took them only an instant to cut off that head, but France may not produce another like it in a century." A possibly apocryphical story relates how Lavoisier arranged a final experiment at his death intended to determine whether and for how long a severed head remains conscious after decapitation (though standard biographies have never mentioned the incident). Supposedly, Lavoisier decided to blink as many times as possible, and had an assistant count the blinks, which numbered between 15 and 20. Berthelot, M. La révolution chimique: Lavoisier. Paris: Alcan, 1890. Daumas, M. Lavoisier, théoricien et expérimentateur. Paris: Presses Universitaires de France, 1955. Lavoisier, A. Traité élémentaire de chimie, présenté dans un ordre nouveau et d'après les découvertes modernes, 2 vols. Paris: Chez Cuchet, 1789. Reprinted Bruxelles: Cultures et Civilisations, 1965. Antoine Lavoisier, Elements of Chemistry, Dover Publications Inc., New York, NY,1965, 511 pages.